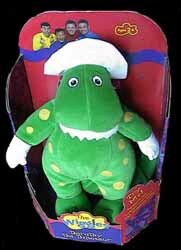 Dorothy is a 5-year-old dinosaur who loves to eat roses and sing and dance with her friends the Wiggles. This plush musical toy is made from polyester fibre with wire stiffeners. She is also wearing her trademark white gloves and a white hat with a red rose. This toy is incredibly well made, and tiny tots will have no problem identifying her from the TV series. The fact that these toys only play the one song each is a bit of a disappointment - it would have been nice to have had a selection of 30 second songs for each character. Thankfully, you can also open the backs up of each character (thanks to a Velcro fastening) and remove the batteries so that your little one can go to bed without accidentally setting the song off every few minutes. Another slight drawback is that these toys are only surface washable. So, should they be dunked in baby food or your toddler have any other dirty mishap, then you'll find it difficult to get these looking as good as new again. Reasonably priced, this range of plush toys is pretty good value for money - although Spin Master also has a range of beanbag toys that are a lot cheaper. On balance, I think that I'd rather buy the beanbag toys, The only extra benefit you have with these plush toys is the fact that they play a 30 second song.